Meat on sticks, sounds rather vulgar doesn't it. Thankfully, the Japanese are not as vulgar as I and have named them something far more elegant, the delightful yakitori. Bincho is a yakitori bar deep in the heart of Soho. With a large yakitori pit ready for grilling meat of all kinds in a matter of minutes and a modest sake list, this is hypothetically a great fast food stop. I say hypothetically. When you have nowhere to go and stomachs to fill, no meal is going to be over quickly, especially when you dine with some of the people I do. So, nicely bedded in after some "musical tables" (we were moved from our rather rubbish low slung table at the edge of the bar to the grandstand table right at the front) we started to look through the menu, and behold, meat on sticks of all descriptions. So we went crazy, ordering everything from pork belly to chicken gizzards, all on sticks. 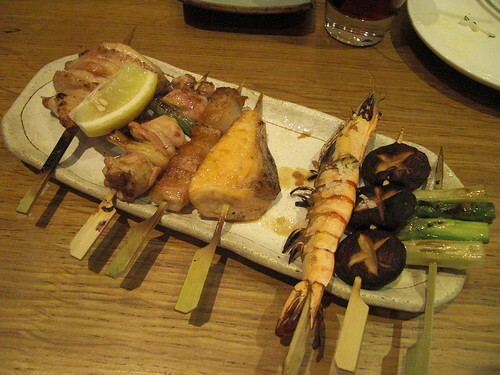 This included the "Seven Samurai Special", a selection of meat, seafood and vegetable skewers. Most of the skewers were extremely tasty, although some challenged me more than others. The chicken gizzards (hard and tasteless) and the salmon were clearly my least favourite, although the tender pork belly and the chicken oysters were standouts. Order them if you come here. And then order more. 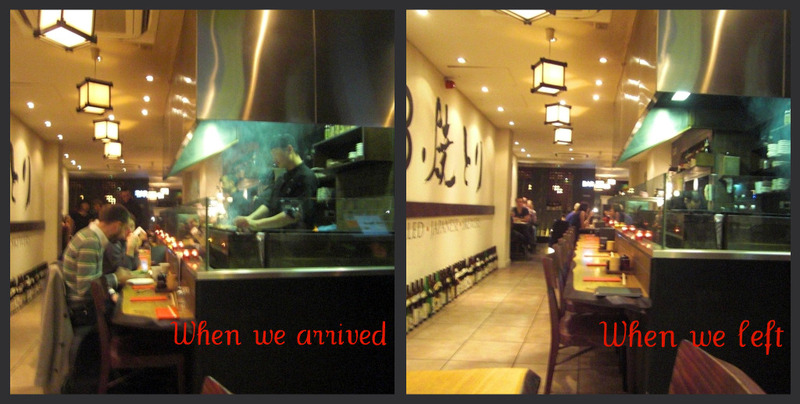 Bincho isn't all about yakitori though, with numerous other choices on the menu. 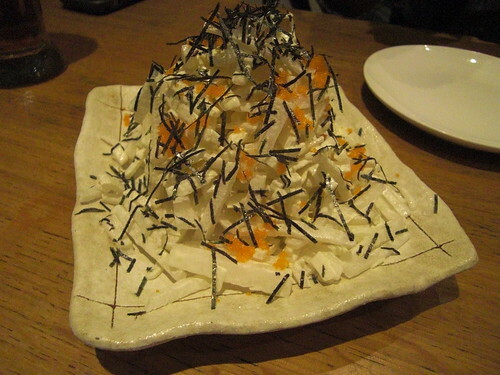 We had a daikon and roe salad (crispy and extremely fresh) and a combination of rice dishes, including an exemplary oyako don, chicken rice cooked in a soy broth and finished off with an egg broken over the top. 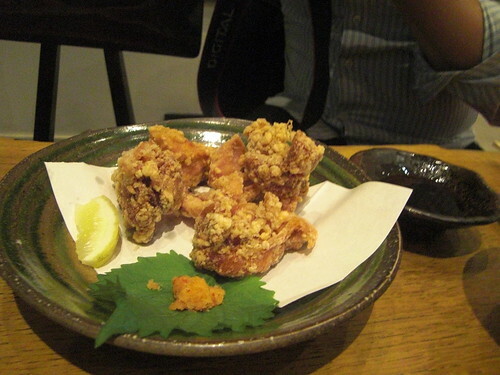 And how can I forget the fried chicken with ponzu. I hadn't tried ponzu before, but the light and tangy citrus dipping sauce was heaven to my lips. 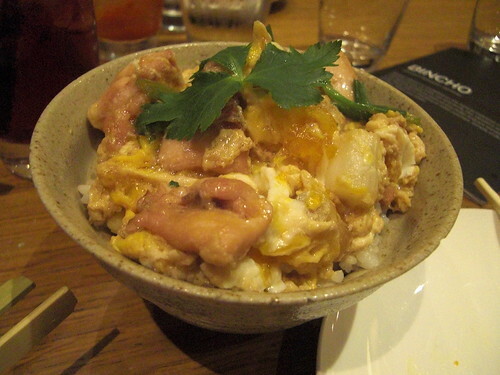 Coupled with the greaseless nuggets of fried chicken, a wonderful dish to be consumed over and over again. I really need to invest in some of this mystical ponzu. I bet it goes with everything. We finished the meal off with dessert and some Californian unfiltered sake, something a little different. And I can safely say, it will probably be the last time I will ever try it. It simply didn't agree with me. But it couldn't ruin a rather enjoyable meal. We had ordered enough to feed most of Tokyo but not a morsel was left. Nor were there really any other customers, they had all gone home. When we finally did ask for the bill, the cost did shock us a bit, coming to just under £40 a head. This did include a few drinks but this is on the upper end of affordable. Great meal, but my wallet wept. 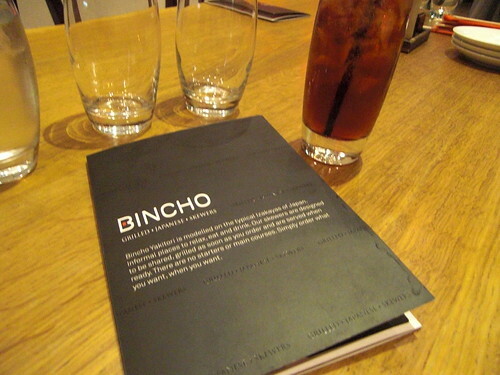 ah I do like Bincho and LOVE the chicken gizzards - quite frankly not enough places serve this in London. ooh, i like the look of this! both the sticks and the bowls look great! Do they still serve chicken sashimi there? i remember someone telling me about this place a while ago, great to read some more about it, thanks! Lex - And is a good fun place to hang out with friends. Next time, sake! Will - I don't remember seeing chicken sashimi on the menu. Is it safe?